A woman thrust the tomato plant into my hands when I displayed a mild level of interest. The pastors set up a garden behind the children’s wing and these were the leftover tomato plants, a bit bedraggled and needing a good home. I couldn’t promise them the good home, but we have dirt in our backyard. I came home and put them in a large planter on a lark. Growing things is new for me. We left a few weeks later for a 6 week trip during which a turtle died but our tomato plant flourished. It was a stunning discovery. It was large and hanging over the edge of the planter! In adjusting back to the U.S. after so long in our former familiar culture, I needed a project to focus my attentions on. I would see this tomato plant through until it produced tomatoes. Picture a woman making a solemn vow. I bought a cage, plant friendly insecticide, tomato fertilizer. Every day I checked on the plant which continued to grow. I read blogs and did weird things like shake the tomato plant vigorously so it would pollinate itself. Bees are scarce and I began feeling mildly panicked about our loss of the bee population in respect to my tomato plant’s chance of success. Imagine my joy when I discovered small yellow flowers! Flowers lead to fruit. Tomatoes are a fruit! Tomatoes should soon come. They did not. The flowers wilted and died without fruit. I got mad at the plant that failed to grow under my helicopter gardening. I stopped watering it and left it to itself in the 90+ degree September heat. It sprang a tomato. Then another. What a tease! Fine, I thought. You’re doing so well on your own, I’ll let you continue that way. So I did. 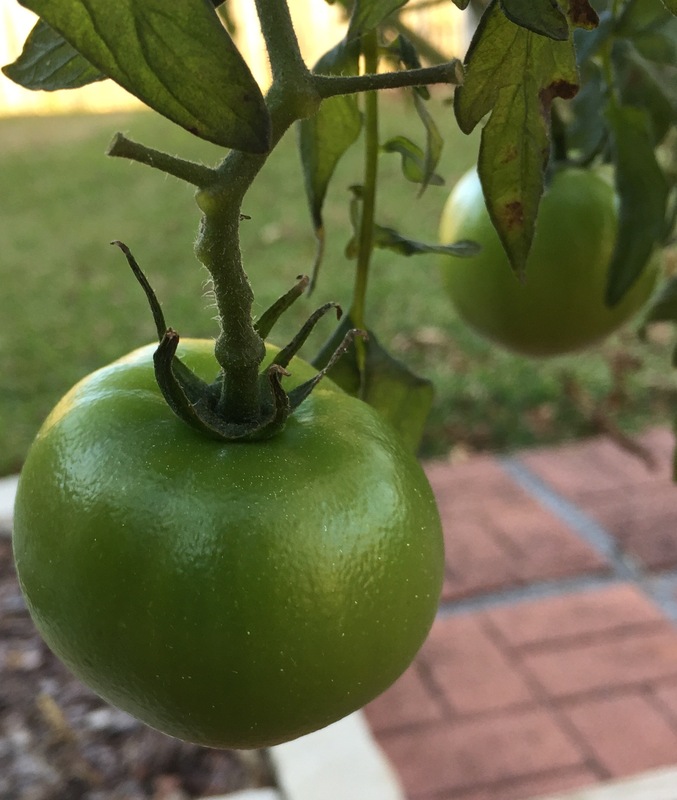 The tomatoes kept growing bigger and still green. I began checking on them again, these very expensive tomatoes. Then it froze this week. 2 nights in a row of a bitter cold. I neglected the tomato plant. It lay out there cold and bare with no blanket to cover it. With Christmas and busyness beyond the norm, the tomato plant got the shaft. I don’t expect any ripe tomatoes now. Just frozen green tomatoes turning to mush. May it yet surprise me. About halfway through this tomato story, I began to wonder why I was writing this up? What does a tomato plant have to do with anything? Probably not much but its served as a visual reminder of principles my heart needs to know. A kind of wrap up on a fall of life and ministry. Only so much is really under my control, and its a very little much. Yet, God can surprise and often uses harsh conditions to temper His children and make them hardier. He doesn’t waste anything. Who knows, maybe I will get more than I deserve, more than frozen green tomatoes. It is supposed to reach back up near 70 this week. But even if I don’t, my tomato plant experience revealed quite a bit about my spiritual life. I plan on trying again. Gardening seems to be a God-given method to teach me His ways. Faith is like sitting in a chair. Ever heard that one? The speaker demonstrates their point by looking at a perfectly good, sturdy chair theorizing about how it looks capable of holding his weight. I usually hear it in the context of a sermon or talk on faith in Christ. Then, it goes on…faith is actually sitting in the chair…trusting the chair. The speaker sits in the chair and, of course, it holds him. Now, this chair…I’m fairly certain no speaker in his right mind wants to demonstrate this deep point using this chair. 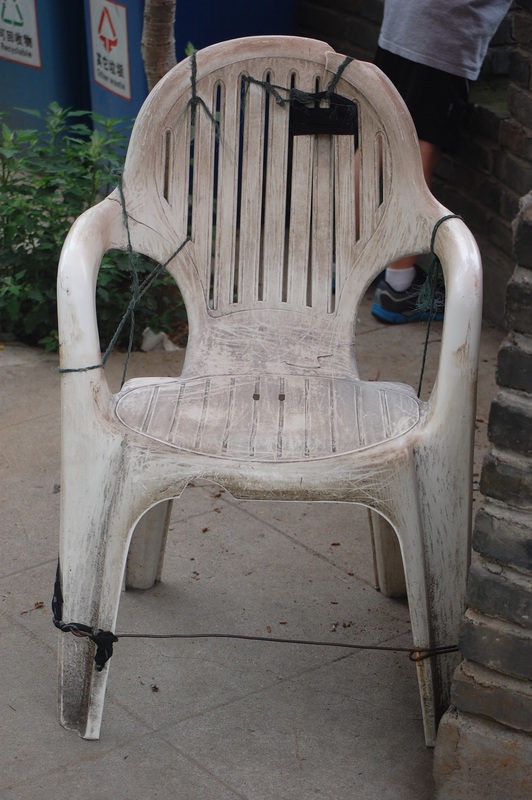 It is a very cheap chair to begin with and, note, wire holds the chair together. Because we repair broken things, we know this chair is broken…but it still might hold a person. This chair compelled me to take this picture. I couldn’t not take this picture. This poor chair is so bedraggled and, yet, so easily and inexpensively replaced that I must wonder at the poverty that motivates fixing it. It is undoubtedly extreme beyond anything I know. I often think this is how it really looks like when I exercise faith. I see a dirty, cheap chair held together by wire and I decide if I want to sit in it. This speaks volumes about how much I trust the Lord but it also explains a reality…often the circumstances do not make it easy to walk in faith. Seldom does the chair look secure. I did not sit in this chair so I cannot write something witty about how I fell or how surprised I looked when it did hold my weight. I do keep remembering this chair as I ponder faith. It reminds me that faith is risky yet the One I choose to place my faith in is not. He is sure but His ways are not my ways. He sees things differently than I do. And, I see things shaded by my fear and imperfections. Sadly, He looks more like this broken chair and what He asks of me looks more like this too. I look for security…crave security… and He asks me to live by faith in the things that are not seen. But every time I sit in what looks like a dirty broken chair, I learn He is trustworthy. What comes to mind about faith when you look at this chair? The sweltering heat presses down on us in the hidden cemetery. I pass by inscriptions of women, children, missionaries, diplomats, and seamen. I imagine some died from mosquito-borne illnesses as I nervously slap away hundreds of the pests. My children flee to higher ground to avoid the onslaught. I and my daughter remain and wander as the clock hastens towards closing time. 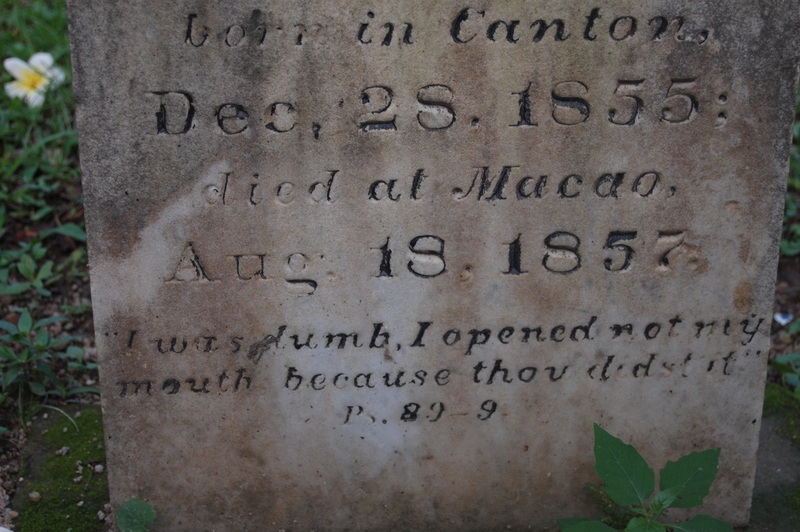 Some inscriptions move me to tears. The small crypt of an infant inscribed with words of surrender even as grief slays the soul. Others give my heart pause to wonder…was it worth it? The sailor whose greatest achievement, the one that took his life, was war to open a port of trade to opium. Most received their burial in the presence of friends or shipmates, not family. 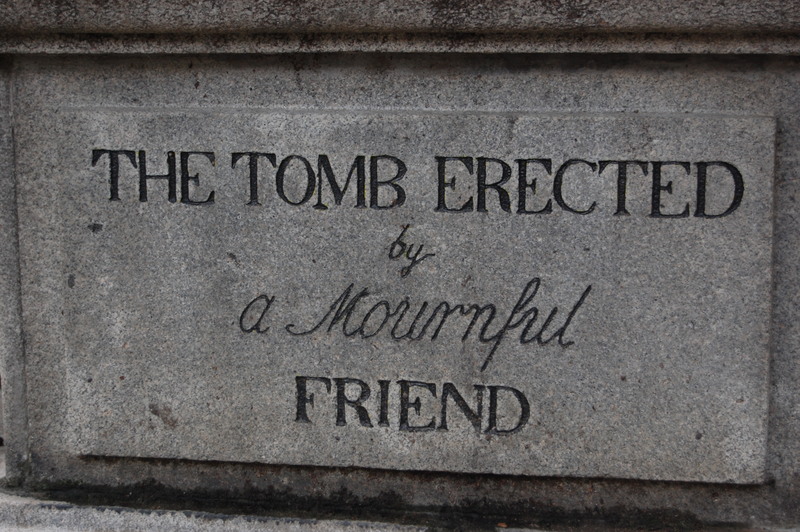 Etched in the side of one stone tomb I read, “The Tomb Erected by a Mournful Friend.” Who was the mournful friend? What does mournful friendship look like in this era? 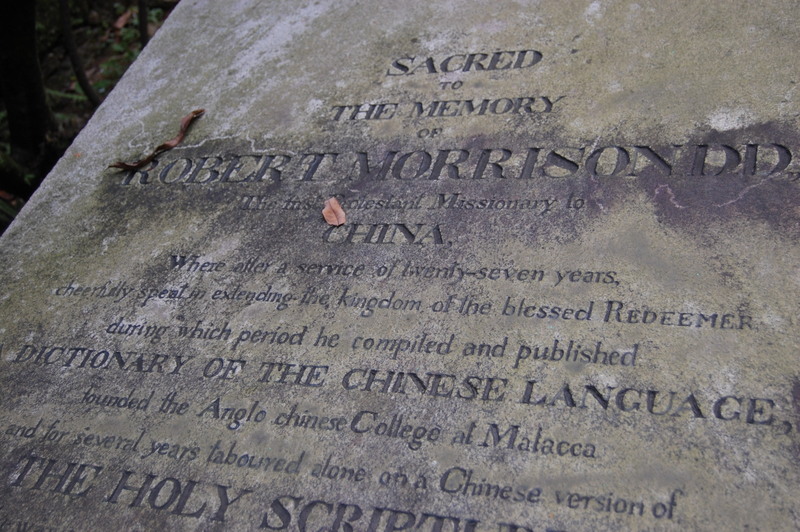 Then, the lengthy inscription of Robert Morrison who translated the Bible into Chinese and created the Chinese dictionary all in the age before computers. We stand on his shoulders along with hundreds of millions of others who daily benefit from his labors. I’m sure my contribution pales in comparison. Am I content to continue even if my labors never amount to such fame? Better to go to a house of mourning…this theme echoes in my ears during the season of goodbye gatherings that recently ended. Do they ever end though? Goodbye parties and cemeteries…my current houses of mourning. Walking through this cemetery anchors my soul to the crucified life. Through the tears I manage to glean something of the realities of a life surrendered. To conquer? To serve? To give my life? To accept loss that comes to my doorstep? To be the mournful friend?